We are looking forward to having Will Vaus with us again, this time as he kicks off his book-signing tour for his new book Speaking of Jack. He will also talk with us about his book Mere Theology, which we have been reading over the last few months. This is going to be a terrific way to finish off our 2010-2011 year! Will is a walking Lewis encyclopedia and our discussions with him are always very interesting. The meeting will start at 7:00 P.M., Friday, 20 May, at the CAMP House, 1427 Williams St., near Broad and Main. You don't want to miss it! 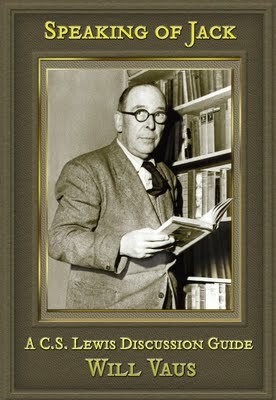 Will's new book is a one-volume study guide to 40 of C. S. Lewis' books, compiled through the years as Will has been involved in various C. S. Lewis Societies. It's put together so you can read through Lewis' works in a three-year period and have discussions with your friends about it. As Dr. Diana Pavlac Glyer (author of The Company They Keep) says about the book, "Good books. Good friends. Good conversations. Will Vaus has found the perfect way to bring them all together. It's genius, and I recommend it." Will is bringing copies of this new book for sale and he'll be happy to autograph them for you. Visit Will's blog by going to: www.willvaus.com. Update, 17 May: Dr. Debbie Higgins, the current manager of the Kilns - the home of C. S. Lewis in Oxford, UK - will be with us at our meeting as well.